Improve decision-making capabilities by bringing unprecedented performance to SAP Business Warehouse with SAP HANA for current data and SAP IQ for historical data – achieving the perfect balance of cost and performance. The adapter for SAP IQ as a near-line solution is delivered with the BW system. The Integration of SAP IQ makes it possible for you to separate data that you access frequently from data that you access rarely, thus making less demand on the resources in the BW system. The near-line data is stored in compressed form. You can thus reduce the costs incurred by data that is accessed less frequently. Please Note that the SAP-NLS Solution can be used with all supported database version supported by SAP BW 7.3x and onwards. Together with NLS Partnersolutions, Nearline storage for SAP BW can also be enabled from SAP BW 7.0x releases onwards. Since SAP BW on HANA 7.50 SP04 Hadoop as NLS Storage is possible as well. Please note that the Partner Interface for Nearline Storage is only supported in SAP BW and is not available in BW/4HANA (SAP NLS IQ and SAP NLS Hadoop are supported). See also the SAP-NLS Roadmap referenced above for more information. SAP HANA on disk when it comes to warm data is still supported? I thought that only extension nodes are now the option for warm data, i.e. DT. Both options are available. DT is also possible for native HANA scenarios and single node and EN is the preferred option for BW on HANA . we are thinking on of implementing the NLS for a SAP BW 7.4 on HANA SP14, and we have a question, is it possible to archive in the NLS the advanced DSO or is it only possible with DSO classics / cubes? This for a BW 7.4. Thanks for the reply Ronald, and for BW 7.4 is there any restriction for classic DSO and cubes? I say this because in the image above it says that the inventory cubes are added. Thanks Roland for the informative blog!! We understand BW/4HANA supports SAP IQ NLS solution. If customer already implemented IQ NLS solution in the existing BW system (non-HANA DB), then customer wants to implement BW/4HANA with green-field approach, and hope to somehow reuse the existing NLS objects in IQ. Is there an option for it? Thanks again for your time! Yes, of course you can use the existing data for reading in the BW/4HANA Greenfield Implementation, but only one System can be the producer of the data. In your case, the non-HANA BW System has created the historical data and not the BW/4HANA Greenfield Implementation. Thanks for the reply!! One question to follow on the reading of existing IQ data. We have concerns on the object type change in BW/4HANA. For example, the IQ object was created based on an infocube in the existing non-HANA BW system. With the BW/4HANA implementation, we will create ADSO to replace the infocube. 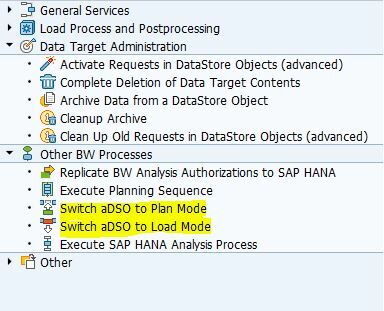 How to link the existing IQ object with the newly created ADSO in BW/4HANA, from technical perspective? Hope my question is clear. Thanks again!! the data would be unchanged and also the structure of the data will not have mayor changes. As already said, my doubt is the initial producer of the historical data. As mentioned Straggler Mgmt. functionality is available with BW 7.5, is it available as 7.5 feature or need to install any Add-On? In case of Add-On’s, what are the available options. The Straggler Solution is available from PBS Software from 7.0x onwards without any restrictions based on the CBW NLS Add-On. I’ve one concern GL, AA, AP, AR, and Inventory data can’t be archived? because when I am discussing with my colleagues his claim is since this modules data will be stored in cumulative basis so its not preferable to do data archiving. can you please share your thoughts on same. FYI we’re on BW 7.4 on HANA landscape. Inventory Cubes can be archived with Nearline storage, but I´m not familiar with GL, AA, AP, AR. Could you please tell me, how to perform NLS archiving for SAP BW7.50 powered by HANA to a HADOOP system? 2363218 – Hadoop NLS: Information, Recommendations and Limitations. Thank you for your answer. I have another doubt, maybe you can help me with this one too. I have read that the master data can´t be archive and is considered hot data by SAP. In the other hand, in some blogs they said it can be done, but don´t mention the risks implades. Dynamic Tiering 2.0 is offering the multi-store table (https://help.sap.com/viewer/e0950e0116e8493d8d4c42762c5d2552/2.00.0.0/en-US/4c842551951e410690804e2b30a3bb16.html). I can imagine that they could be quite useful in relation with data tiering as the logical table object can be distributed among HANA memory and an extended storage. Is it planned for BW to use these tables one day? IMHO it would allow to bypass some of the limitations of NLS. …And another question: In the new roadmap for NLS (Feb. 2017), you mention for cube like ADSOs on page 7 “in staging mode”. Could you please briefly let me know, what the “staging mode” is? this means you can switch between aDSO for planning (locked against load) or load modus (locked against planning). The procedure is handled by process chains. we have recently installed sybase IQ as Near Line storage. It will be linked with Quality System of BW. While searching for license of type CP under test system in SAP marketplace I couldn’t found any. It is showing License Type as DT. Can anyone please tell me which license type we have to use for quality server and what kind of installation needs to be done. will it be of type CP or DT. Hello Roland, this question is a bit not exactly linked to this blog but somehow related. The customer currently has PBS addon and has been using this solution for NLS IQ for years and now recently migrated to the SAP NLS solution. Would now like to get rid of the ABAP addon PBSCBW and the namespace /PBS/ .. how do we go about such a cleanup? Actually if you have the PBS Add-On, you have more Functionality than SAP would ever deliver. Furthermore PBS has tools, to migrate the data to the SAP Notation, which is independent from the Software Namespace. Which are the special requirements that must be achieved to run NLS (Sybase IQ)? or Where could I find them? Can you elaborate please, customer is on BW 7.5 SP3 (HANA). Like which join scenarios are not supported or point to a document. Could not find details in SAP Note 2215265 w.r.t ‘Joins’. we are facing an issue when we are adding the one field to NLS enabled ADSO. Is there any prerequisite to follow. Once the data is archived in NLS, it is said that we can have an SDA connection to read the data, But what does SAP recommend, should we create a virtual table on NLS table and use it in calculation view and a new report on top of it or is there a way that the virtual table created using SDA can be used with existing info-provider? Might be I am reiterating the question :). Do we have straggler on ADSO as well? Please share any supporting document. In our scenario, we have stragglers coming in almost every DSO. As customer don’t want to proceed with 3rd party tool, what is the next available option/solution? What are options on BW4HANA for straggler management. 1. The Pilot Program for “Straggler Support on aDSO for SAP BW 7.50 on HANA” was stopped recently. 2. At this time there is no adequate solution from SAP available. thanks for this valuable Blog. Helped me already quite a few times. I`m currently in the planning phase at a customer who is leveraging BW 7.50 on Oracle with NLS on IQ. Next year they will move with their BW to BWoH 7.50 running on IBM Power. We have various surrounding Systems like DS, SLT, BI Platform etc. Repositories for those Systems will be hosted on DB2. Is there some kind of “migration path” moving from NLS/IQ to NLS/DB2? Is this done via DMO? If i understand the provided links correctly than the DB2 option for NLS is native? Meaning we dont need the partner solution of PBS anymore? We’ve enabled SDA option and we could see improvement in query runtime when NLS data is read. However report runtime degraded when Online (HANA) data is read, in RSRT I could see query is reading NLS where 80% of time spent ( 0 records are selected/transferred), since all the data is in memory only. Any suggestion/advise would be of great help. There is a requirement that the data models and reports are in SAP BW 7.5 SP7 on DB2 and also data was archived through NLS in DB2. Now want to migrate this to SAP BW on HANA/BW4HANA with NLS option as Hadoop or SAP IQ. How to handle the migration of currently enabled NLS in DB2 to SAP BW on HANA/SAP BW4HANA for archived data? Thanks Roland for the quick reply. Is the PBS Software also valid for migrating to SAP BW/4HANA ? i.e., Migration of currently enabled NLS in DB2 to SAP BW/4HANA for archived data? This could be changed in the Future. we are planning to implement a NLS to reduce our BW database. Is there a recommendation for a hardware sizing (number of CPUs / RAM / HDD)? thanks, the document is very helpful. There’s only one question I couldn’t get answered clearly: if we decide to build our NLS in a virtual environment, is it necessary to reserve fixed CPU resources? Or can it be handled dynamically? Are the any roadmap for the problem with the BW stragler for archived data in NLS ?? If an delta record is loaded to a target and the records to updated has been archived the delta load will fail. The only option is then to 1) reload the archived data 2) update the delta load 3) archived the data again. is it useful for any reason to implement also a “test”-NLS conntected to the DEV system? Or is the regular way to have only a productive NLS? I’m asking because of planning an additional hardware invest or not.